Of course, anyone who has struggled to produce an entire message convincingly using misprints or third or fifth clue letters knows that this device is the most forgiving. Less forgiving was the message that we ultimately deciphered, since those repeated words at the start of clues were rather a giveaway. Your first vetter or test-solver would be saying, “You have used ‘Unchosen’ twice”: “You have ‘Highlighted’ and ‘Highlight’ in your clues, you’ll have to change one of them”, and so on. We spotted that hint immediately and attempted, at once, to make sense of the first clue words. But, of course, the device was nicely concealed in prime numbers, OBSERVE PRIME NUMBERED CLUE FIRST WORDS as we learned later. That was to come. First, I did a quick run through to check that Spud qualifies for the Listener Setters ‘ Imbibers .Org. and, sure enough he was indulging in ‘Medicinal drink implicated in parts (6)’ giving PTISAN* with an extra R, and ‘Spirit, not ancient rum, swallowed by father (6)’ (PA round NE + [R]UM = PNEUMA). Solving proceeded steadily for a couple of hours with that message slowly emerging though we had one Numpty red herring when we decided that the Indian bird had to be an ARGUS in the clue ‘Indian bird bears hurtful, seedy coverage (7)’ AR[G](ILL)US we parsed, producing a peculiar FIRGT in our message. Clearly it had to be FIRST. Back to Mrs Bradford, as usual, and she told us that a SARUS is an Indian bird too! We immediately spotted what was going on; not one of those days of grid staring that some of us in the Listener-grid-staring-club commiserate about. A WEDDING, PLEASE JOIN ADAM AND EVE, R.S.V.P. Then we saw STEVE and recalled something about a movie called Adam and Steve. We saw MAC and MIA too, lurking on the sidelines but the preamble was clear about ‘comprising five sections’ and they were marginalised and evidently not invited. Rant over! Did you notice that I had A WEDDING two paragraphs above. We were given free choice about what we highlighted with the constraints that it must be five sections and 30 to 33 cells. 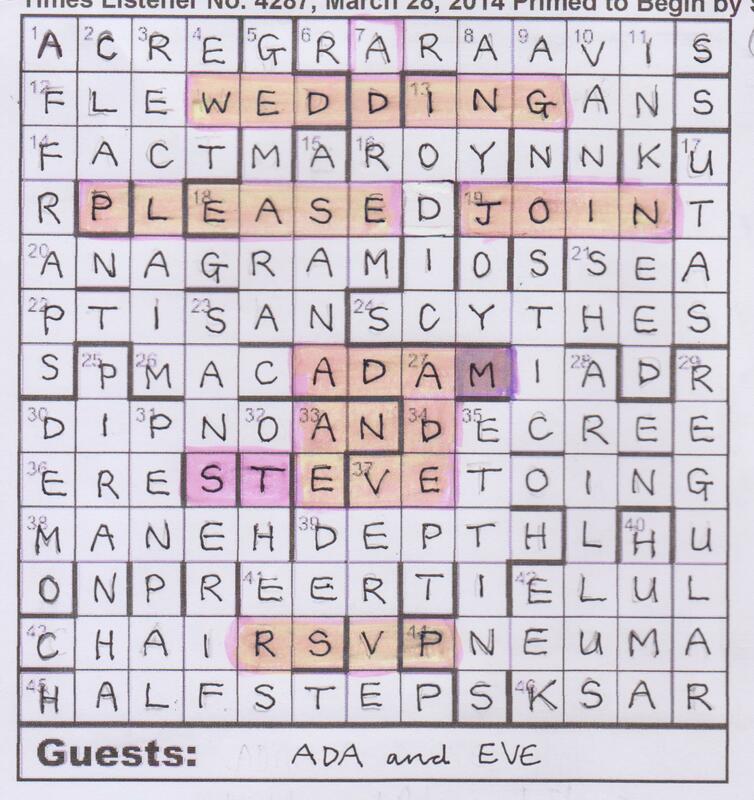 I wonder what JEG will do to an entry that highlights 31 cells inviting ADAM AND STEVE to A WEDDING of ADA AND EVE! Thanks anyway, Spud. Piece of cake? Not quite! Let’s raise our glasses to the compiler and to the happy brides, grooms, whatever! This entry was posted on 18 April 2014 at 4:05 pm	and is filed under Solving Blogs. Tagged: Primed to Begin, Spud. You can follow any responses to this entry through the RSS 2.0 feed. You can leave a response, or trackback from your own site.